In the July/August 2018 issue of Canadian Geographic, Margaret Munro explores the challenge of protecting the species-rich Fraser River delta in the face of Vancouver’s ongoing economic boom and asks whether nature and development can coexist. Read an excerpt and see more of photographer Ben Nelms’ images of the area below, and pick up the issue on newsstands July 9. — Ed. Laudable goals, but critics find them hard to square with the dangers the ever-expanding city poses to the Fraser estuary. Huge ships loaded with jet fuel will soon start using the Fraser River to supply Vancouver International Airport’s new $110-million fuel depot, which will hold 80 million litres and connect to the airport via a 13-kilometre-long underground pipeline. And hundreds more vessels a year could soon be transiting the estuary’s increasingly busy waters to a new $400-million riverside liquefied natural gas expansion project, a proposed coal-shipping facility and, in nearby Burrard Inlet, the marine terminus for Kinder Morgan’s $7.4-billion Trans Mountain oil pipeline extension. 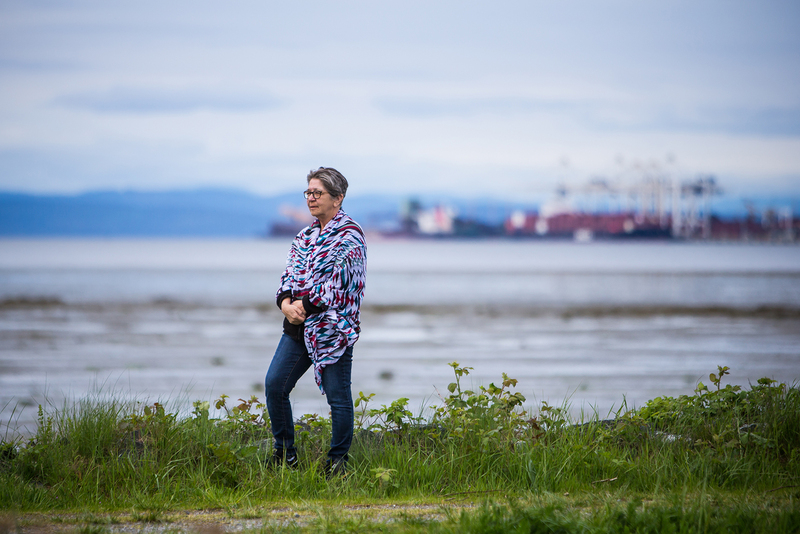 “A spill could be disastrous,” says Anne Murray, a Delta, B.C., resident and member of the board of directors of Bird Studies Canada, looking out from the viewing platform to the shipping channel as a cargo ship sails by. Then she points south to the sprawling Roberts Bank port, which is just outside the protected wildlife area and could soon be undergoing a $2-billion expansion. Trains and transport trucks stream out to an artificial island where 137-metre-high megamax cranes resembling Imperial Walkers from Star Wars lift cargo on and off some of the world’s biggest ships. 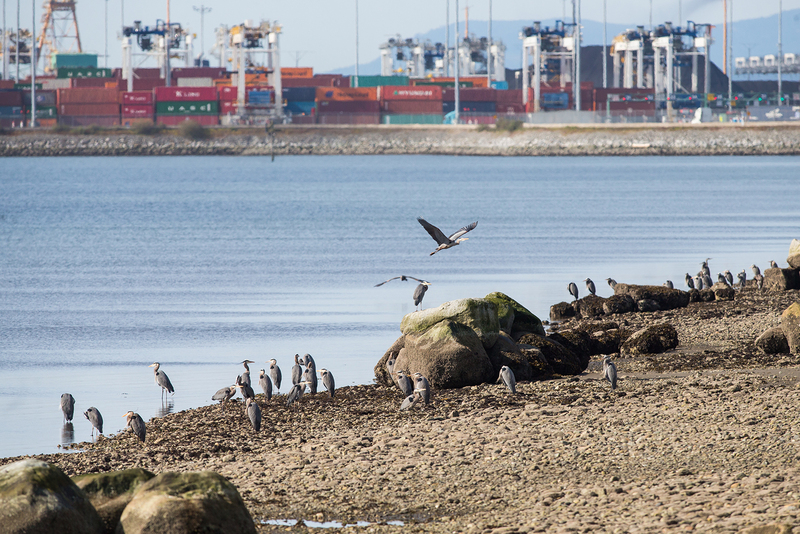 The Port of Vancouver has already transformed critical bird habitat into shipping and transportation facilities and has ambitious plans to industrialize a lot more. “Developers just keep nibbling away — a port facility here, a highway there, a fuel-farm there,” says Murray. Less than 30 per cent of the estuary’s historic wetlands remain and dozens of its species — from salmon to shorebirds — are under threat, making the region one of the most imperilled ecosystems on the continent, a bright red spot on BirdLife International’s global map of critically endangered sites. Robertson, who steps down this fall after 10 years as Vancouver’s mayor, says the importance of the estuary and surrounding Salish Sea cannot be overstated. “It’s been the lifeblood of the community since people first arrived here,” he says, stressing the estuary and its biodiversity must and can be protected and restored even as the city grows. He points to technologies reducing the environmental impact of sewage and transportation in Metro Vancouver and to the rewilding of small corners of the city as initiatives that can be built on, but notes that federal, provincial, local and First Nations governments and developers must work together to make protecting the estuary a priority. 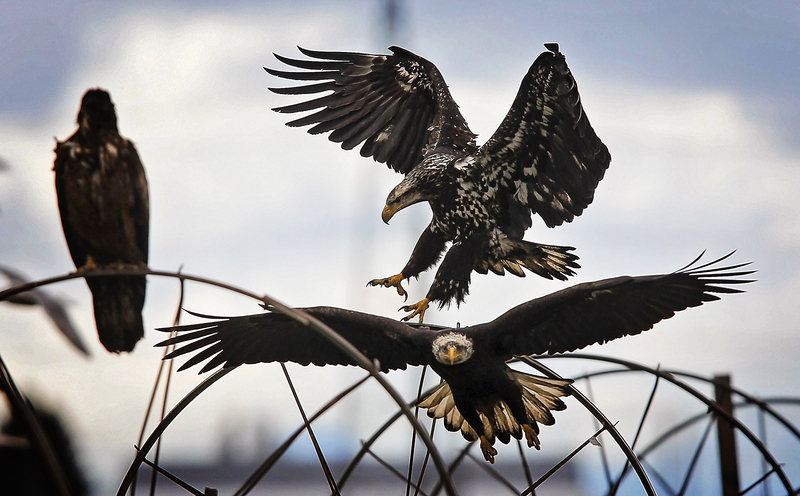 Golden eagles and bald eagles fight over food in Delta, British Columbia. 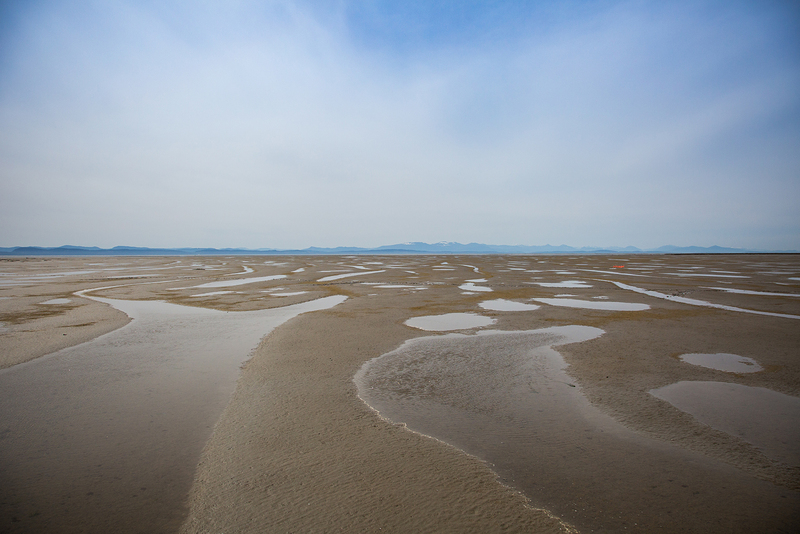 Tidal flats at Brunswick Point in Ladner, B.C. 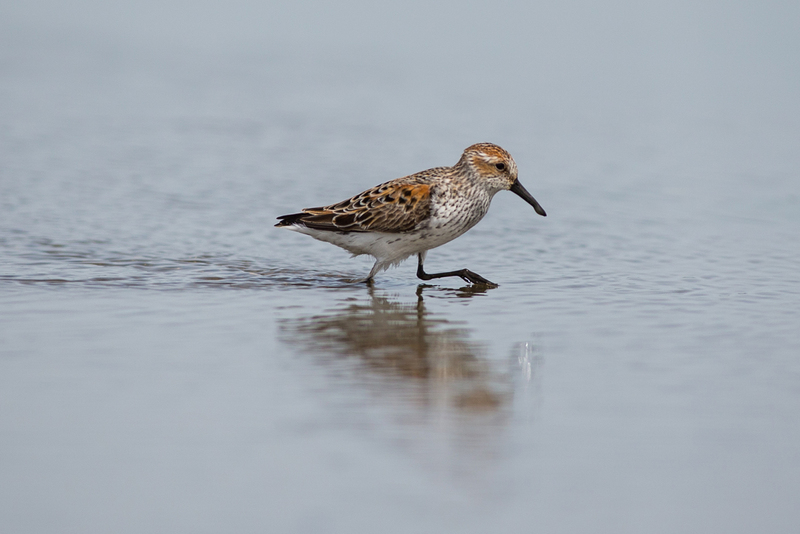 A western sandpiper wades through the tidal flats at Brunswick Point in Ladner. 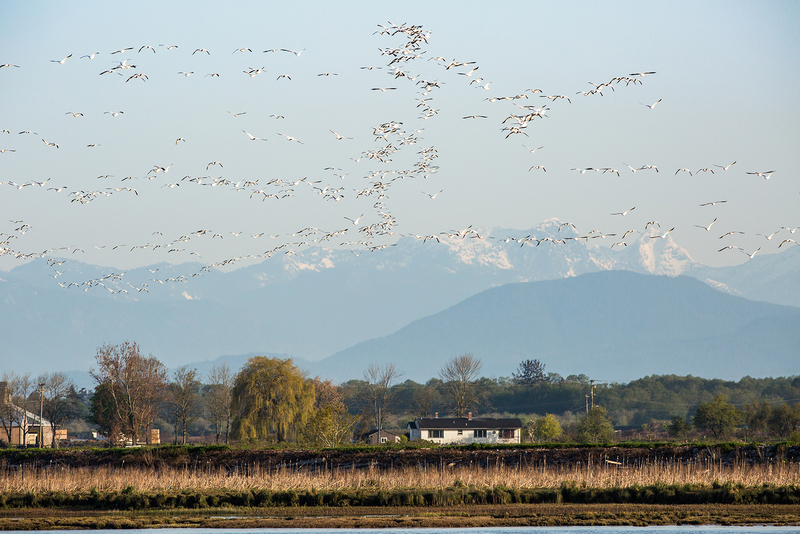 Snow Geese migrate North across the Fraser River of Brunswick Point in Tsawwassen, B.C. 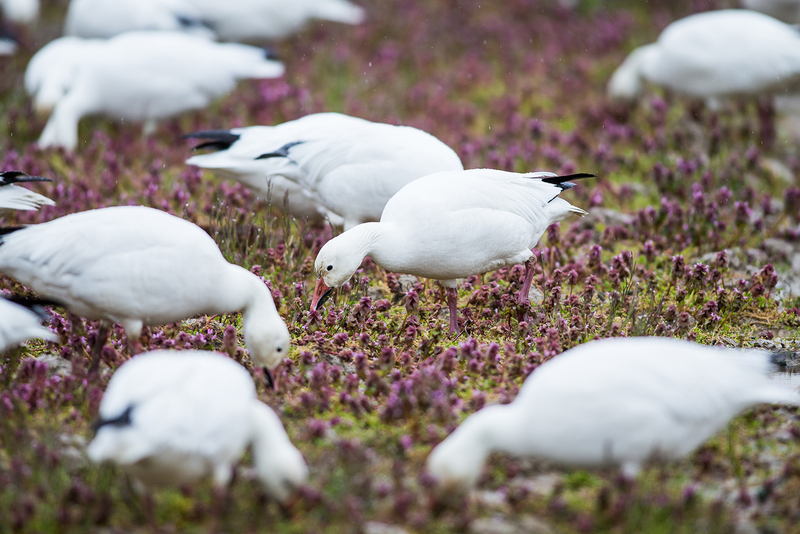 Snow geese feed in a farmers field near the Alaksen National Wildlife Area on Westham Island, B.C. 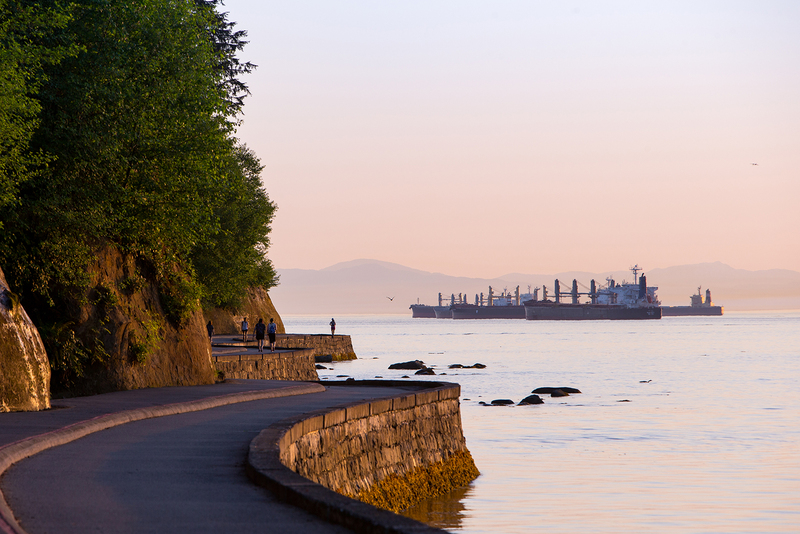 Joggers run along the Stanley Park seawall in Vancouver, past container ships moored in English Bay. Great Blue Herons feed on tidal shores near Roberts Bank Terminal in Ladner. Elder Barb Joe is pictured on the banks of the Tsawwassen shores. Joe can still remember a time when her family lived off the land, foraging for berries, hunting geese and deer, and catching salmon, sturgeon and eulachon.